Make this Beloved Instant Pot Lemon Chicken Recipe (Pressure Cooker Lemon Chicken). 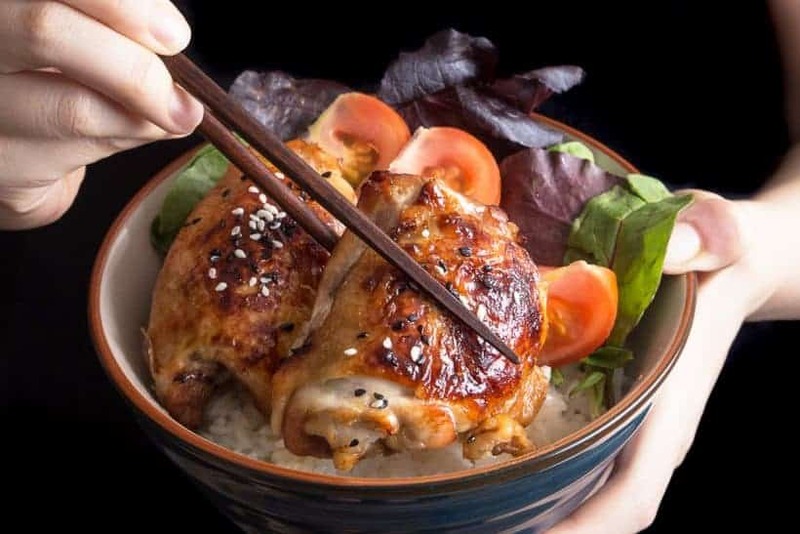 Tender & moist chicken drowned in a beautiful marriage between American Chinese flavors – refreshingly sweet & sour honey lemon garlic chicken sauce. Super easy to make even on a weeknight! Running a restaurant is tough. Real tough. But each satisfied smile you see on customers’ face makes everything worthwhile. On the days where Jacky and I helped out in my dad’s Chinese restaurant, we wouldn’t get away a day without diners after diners ordering the Beloved Chinese Lemon Chicken. Probably top 10 on the menu! On crazy days when we needed a quick fix for some sweet & sour secret sauce. This Zesty Sweet Instant Pot Lemon Chicken Recipe inspired by my dad’s restaurant just hits the spot. Oh~ your taste-buds will fall in love with the sweet, savory, tangy delicious lemon garlic sauce! 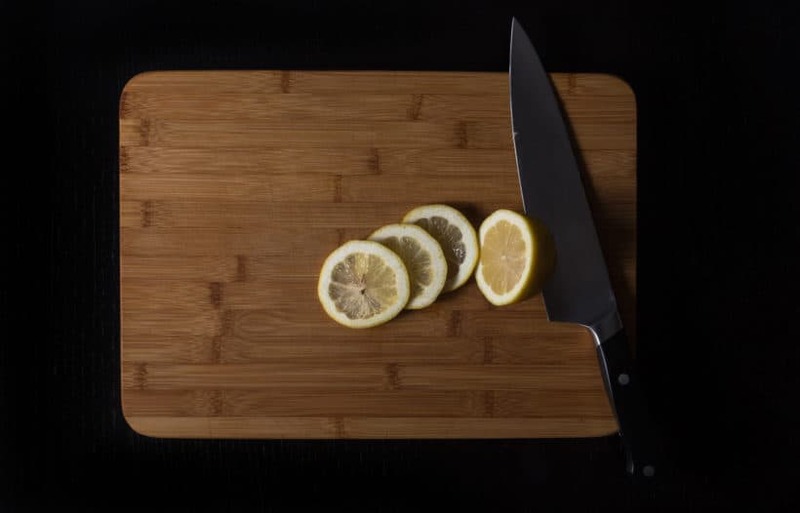 *Pro Tip: Per Gordon Ramsay, be sure to roll the lemon on a cutting board before slicing – it’ll soften the lemon and releases the juices. For this Instant Pot Lemon Chicken Recipe, slice half the lemon, then juice the remaining half. Pat dry the chicken thighs’ skin with paper towels. Pour 1 tbsp (15ml) peanut oil in pressure cooker. Ensure to coat oil over whole bottom of the pot. 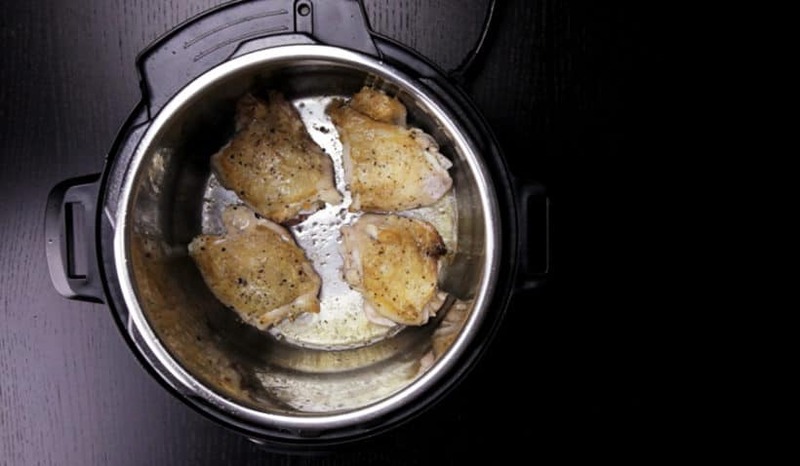 Place 4 chicken thighs (skin side down) in Instant Pot. Do not overcrowd. Season the meat side lightly with more kosher salt and ground black pepper. Brown the skin side (don’t touch it for 4 minutes). Flip and brown the meat side for 1 ½ minutes. Remove and set aside. *Note: If you are preparing 8 chicken thighs, repeat this step for the remaining 4 chicken thighs. Add minced garlic and sauté for 30 seconds until fragrant. Add a dash of Shaoxing wine in Instant Pot and deglaze by scrubbing the flavorful brown bits off the bottom of the pot with a wooden spoon. 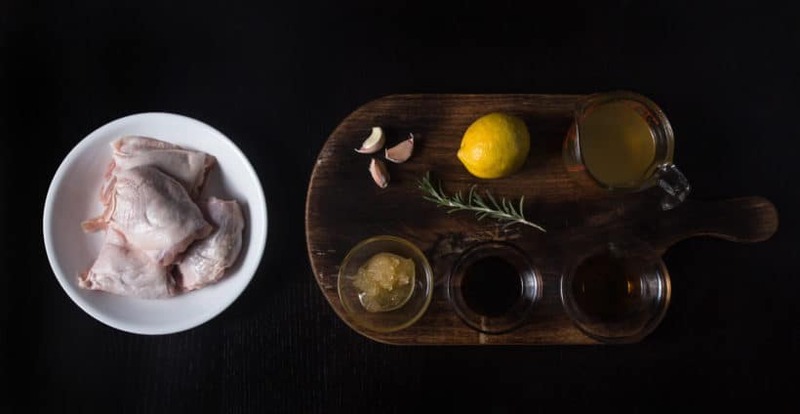 Add ¾ cup (188ml) unsalted chicken stock, 1 tbsp (15ml) light soy sauce, 1 tbsp (15ml) freshly squeeze lemon juice, lemon slices, and a pinch of rosemary (rub the rosemary with your fingers to “activate” them). Give it a quick stir and place 4 – 8 browned chicken thighs on top of the lemon slices. 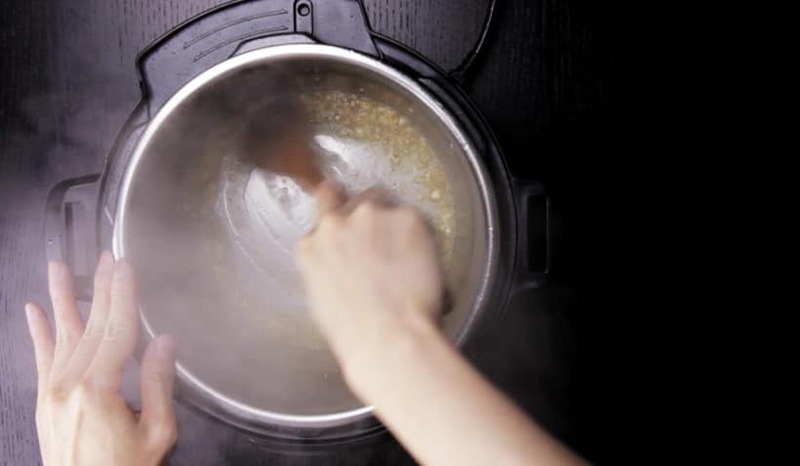 Pressure Cooking Method: High Pressure for 5 minutes, then 10 minutes Natural Release (after pressure cooker has finished cooking, wait until the floating valve drops. It should take roughly 10 minutes). Set aside the cooked chicken thighs on a chopping board. Stir in 3 tbsp (63g) honey. In a small mixing bowl, mix 2.5 tbsp (22.5g) cornstarch with 3 tbsp (45ml) cold water. Mix it in one third at a time until desired thickness. Taste the gravy and season with more honey, salt & black pepper if necessary. 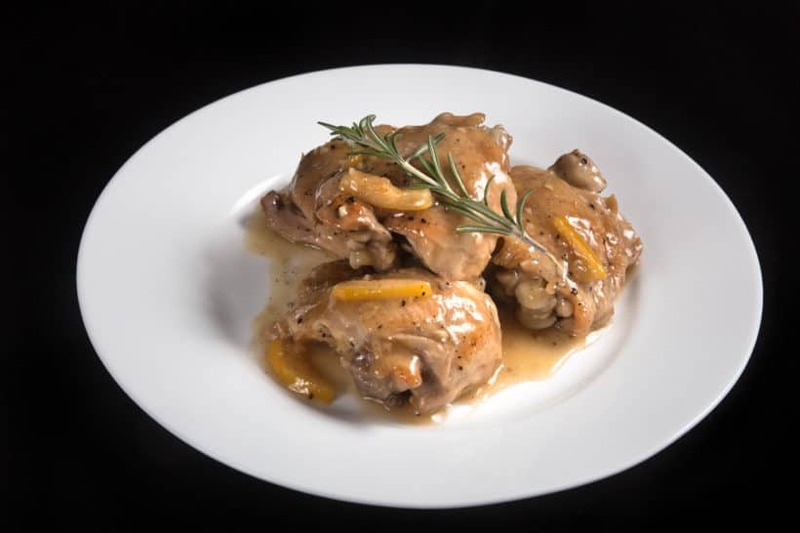 Drizzle the lemon sauce onto the chicken thighs and garnish with optional fresh rosemary if desired. 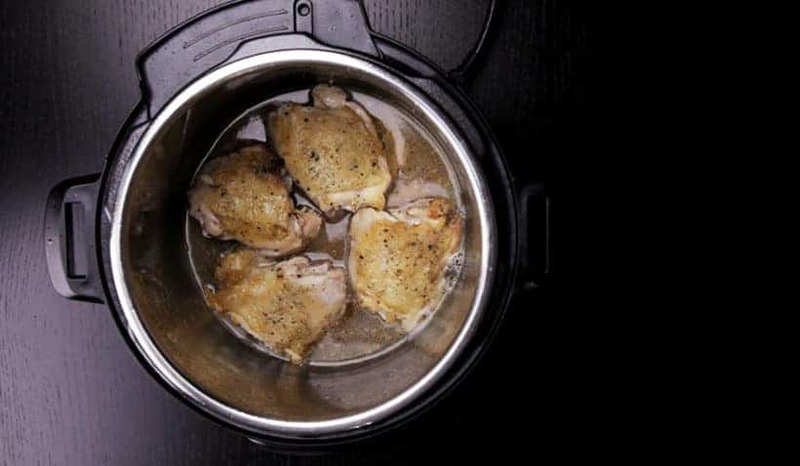 Make this Beloved Instant Pot Lemon Chicken Recipe (Pressure Cooker Lemon Chicken). 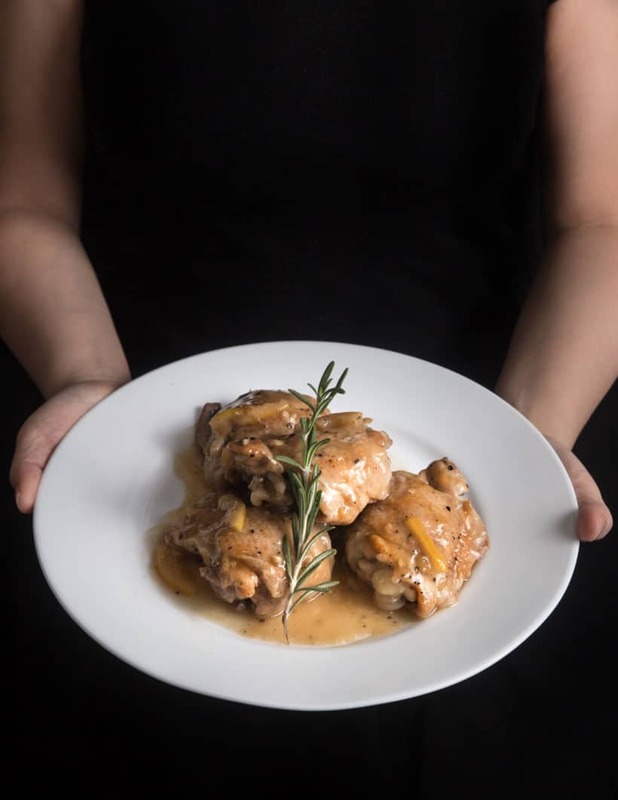 Tender & moist chicken drowned in refreshingly sweet, savory, tangy honey lemon garlic chicken sauce. Super easy to make even on a weeknight! Prepare Chicken Thighs: Pat dry the chicken thighs’ skin with paper towels. Season with generous amount of kosher salt and ground black pepper. Brown Chicken Thighs: Pour 1 tbsp (15ml) peanut oil in pressure cooker. Ensure to coat oil over whole bottom of the pot. Place 4 chicken thighs (skin side down) in Instant Pot. Do not overcrowd. Season the meat side lightly with more kosher salt and ground black pepper. Brown the skin side (don’t touch it for 4 minutes). Flip and brown the meat side for 1 ½ minutes. Remove and set aside. *Note: If you are preparing 8 chicken thighs, repeat this step for the remaining 4 chicken thighs. Sauté Garlic: Add minced garlic and sauté for 30 seconds until fragrant. 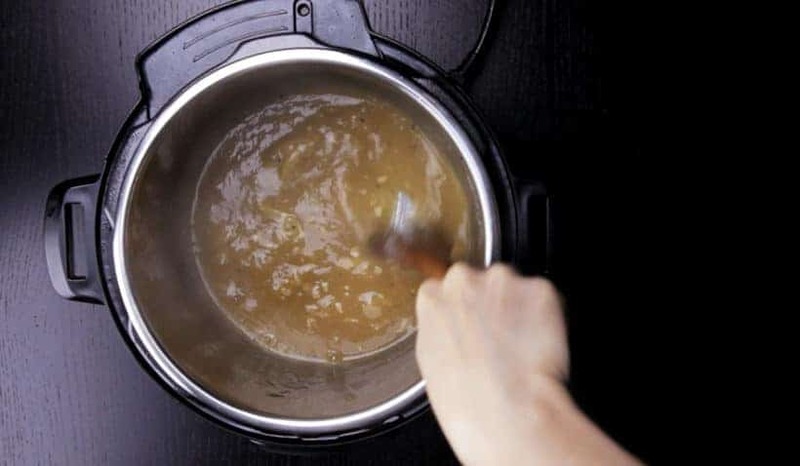 Deglaze: Add a dash of Shaoxing wine in Instant Pot and deglaze by scrubbing the flavorful brown bits off the bottom of the pot with a wooden spoon. 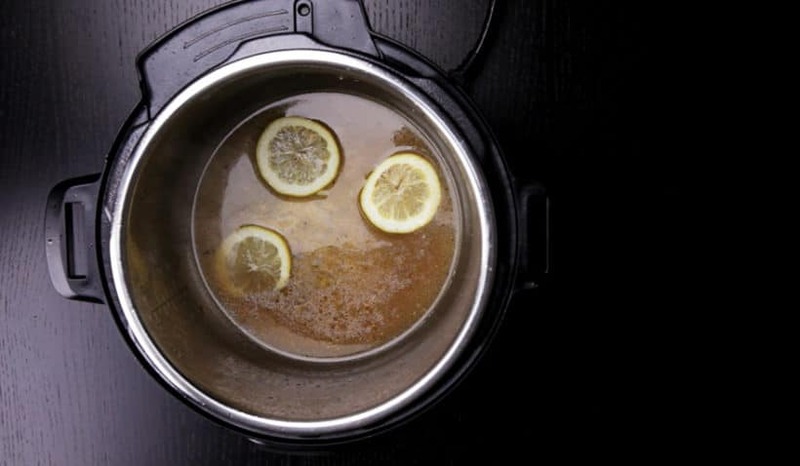 Pressure Cook Lemon Chicken: Add ¾ cup (188ml) unsalted chicken stock, 1 tbsp (15ml) light soy sauce, 1 tbsp (15ml) freshly squeeze lemon juice, lemon slices, and a pinch of rosemary (rub the rosemary with your fingers to “activate” them). Give it a quick stir and place 4 - 8 browned chicken thighs on top of the lemon slices. Close lid and pressure cook at High Pressure for 5 minutes + 10 minutes Natural Release (after pressure cooker has finished cooking, wait until the floating valve drops. It should take roughly 10 minutes). Turn off the heat. Open the lid carefully. 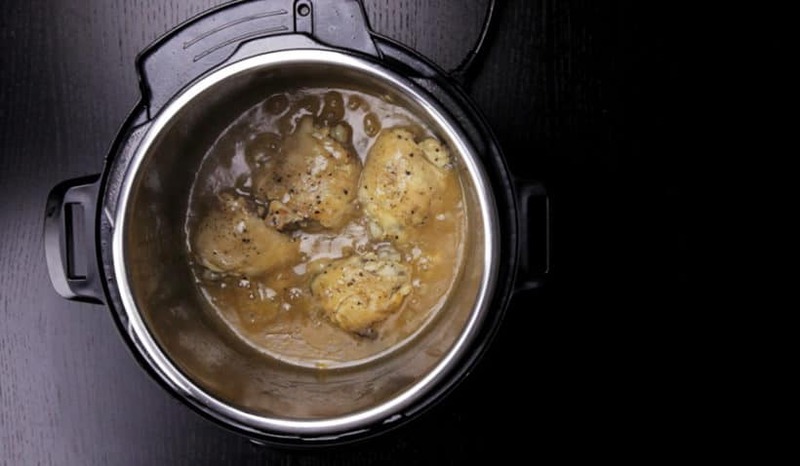 Thicken Gravy: Set aside the cooked chicken thighs on a chopping board. Press Cancel button, then Sauté button to heat up the sauce. Stir in 3 tbsp (63g) honey. In a small mixing bowl, mix 2.5 tbsp (22.5g) cornstarch with 3 tbsp (45ml) cold water. Mix it in one third at a time until desired thickness. Taste the gravy and season with more honey, salt & black pepper if necessary. 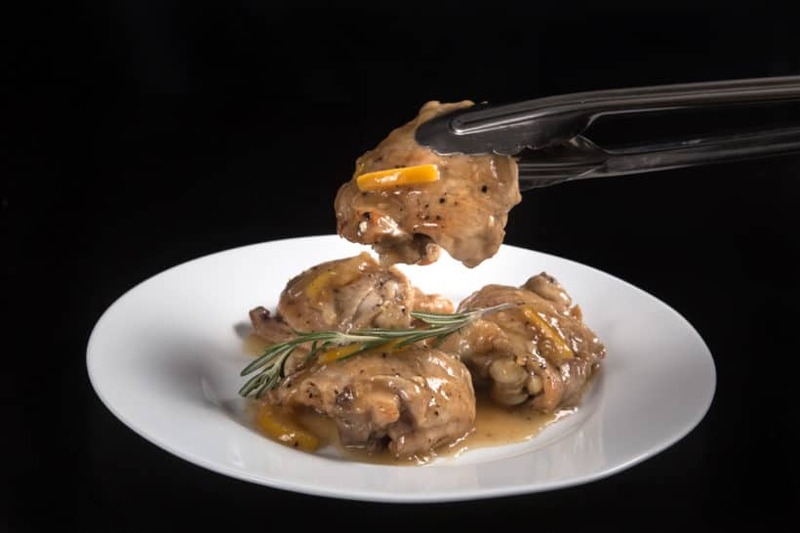 Serve: Drizzle the lemon sauce onto the chicken thighs and garnish with optional fresh rosemary if desired. Is there a way to print this on one page only? I don’t want to be flipping back and forth between pages while cooking. There is a print button on the top of the recipe card. It will create a one page printable version. Hi there! Does the cooking time change if the chicken is frozen? Yes, you will need 2 -3 more minutes. I will be cooking this later in the week. I had to order the Shaoxing rice wine from Amazon! I was unsure of the brand to get. Are there dramatic differences, or is Shaoxing wine pretty consistent in flavor across brands?? For cooking purpose, Shaoxing wine will not have too much difference. Try to find one with the least amount of salt or not salt added. The family really enjoyed this and will have it again. Thanks. FYI, the amount of honey in the recipe, measured in grams, is incorrect. You have indicated its 42 grams (2 tbsp worth) and it should be 63 grams (3 tbsp). You are right about the amount. I am correcting it now. Thanks! Easy, quick and excellent. Just made this tonight for the first time in a pinch because I had all the ingredients and no other plans. It’s definitely going on my Go-To list for weeknight meals. The sauce was amazing; a hint of lemon, balanced with the subtle, silky sweetness of the honey. I paired it with couscous and mixed vegetables and had no leftovers. Oh – and all in under 30 minutes. Help pls. Trying to print recipe. Print button takes me to Roasted Potatoes. I’ll rate recipe after I’ve tried it. Thank you for your question. You can use water or chicken stock. I use rice vinegar with great results. my parents and siblings absolutely loved it! Happy to hear your parents and siblings enjoyed it! this was my first recipe in my new pot. LOVE it. chicken juicy & the flavor was out of this world. thank you, Amy & Jacky~! can’t wait to cook more!! Chicken same out very delicious. Way better than initially thought. Now that our 1st dish was a success, gonna move on to the 2nd recipe. Thanks for awesome recipe!!! Great instructions. I will make again. I would add more lemon…didn’t seem to be lemony enough. Also, I would use less salt. I made this recipe over the weekend and it was FABULOUS!! The only thing I had a hard time with was finding shaoxing wine so I substituted sherry. I love the format of your recipes. I’m sure it takes extra work but it’s so nice to see the ingredients needed in each step so clearly. Just loved this recipe. My husband not a big lemon fan, but said this was just the right amount and served it over pasta. The only thing I would say with all the recipes I have tried, and they all have been delicious, and will be making a lot more, is to list your ingredients in the order that you use them. With this one showing the honey after chicken stock, I kept reading it over again to see if I missed something before putting the chicken back and putting on pressure. I then realized it was more in the taste of the sauce at the end and just squirted some in to taste. I have found this with other recipes as well. Thank you for all the recipes you put out, YUM! I’ve always loved lemon chicken and this is absolutely delicious. It was the first thing that I cooked in my instant pot. Thank you for sharing it. Cook it all the time and love it. We really enjoyed this recipe. It was our first time using our instant pot. So easy and absolutely delicious! I tried making this today and it turned out great except one thing. There was a slight bitter taste to the sauce. It didn’t seem like a lemon thing since I love lemons and am familiar with their type of sour. What could possibly make this bitter? It could be the Shaoxing wine. Mine came out bitter as well and I didn’t use the wine. I actually think it was the lemon that made it bitter for some reason by cooking in the pot. I’m considering next time putting lemon juice and zest in after it has finished cooking. I am excited about making this lemon chicken. I just bought a large bag of boneless skinless chicken thighs. I won’t be able to leave them to saute that long, will I? No skin to brown. You can just brown the meats on each side to deepen the flavor. I cannot wait to try this recipe! If I use boneless/skinless chicken thighs should I still brown them? Since the pieces of chicken are smaller would it still be 5 minutes on high pressure? When the cooking time has elapsed, is it best to leave it on “warm” or to unplug the pressure cooker. Will the results be different? Would leaving it on “warm” dry out the chicken? Thanks for another fantastic recipe! I had this recipe tucked away until I tried it for dinner tonight. I wasn’t sure about the sauce as I was putting it together but it was spot on, as usual! Thanks for another fantastic recipe! It will be on rotation at my house from now on. What oil can you suggest to replace peanut oil? Do you use peanut oil for the high smoking temperature or flavor or..? Grape seed oil and avocado oils have higher smoking temperatures. Would either of these be good substitutions? We use peanut oil for this recipe as it’s flavor matches well with the recipe. Avocado oil will work as well! 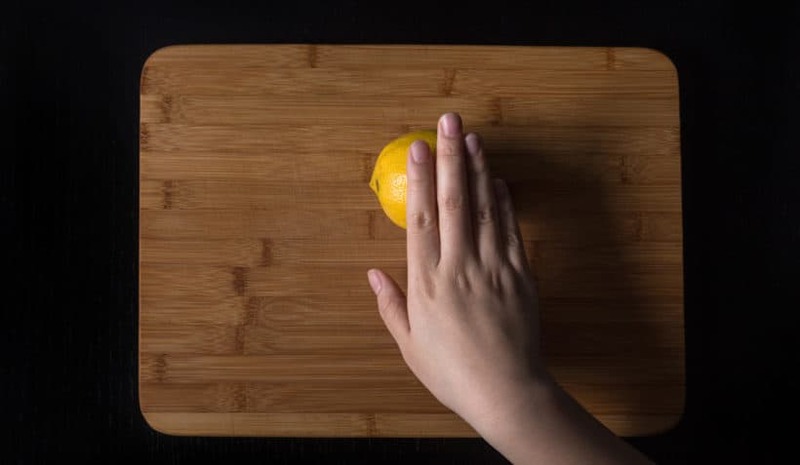 Hi Amy + Jack, for STEP #6, “Pressure Cook Lemon Chicken: Add ¾ cup (188ml) unsalted chicken stock, 1 tbsp (15ml) light soy sauce, 1 tbsp (15ml) freshly squeeze lemon juice, lemon slices, and a pinch of rosemary…”, if I am doing 8 pieces of chicken thighs, instead of 4, do I double up on the aforementioned ingredients, especially the chicken stock, to, say, two ¾ cups (1.5 cups)? For this recipe, you don’t have to increase the chicken stock. You may want to increase the spice and seasoning by 25% as more chicken juice will be released and dilute the sauce. Hi Amy and Jackie what an amazing recipe and so unbelievably easy to make. I actually made 12 thighs as I was feeding my whole family and it turned out perfect. My husband, son in laws and daughters couldn’t stop saying how delicious it was. As always I give credit to your site which I am so happy I discovered. Your instructions and photos are right on. Thank you again for sharing all your recipes with us. The both of you are life savers. I also made 2 cups of rinsed jasmine rice (470 g) and a little more than 2 cups of chicken stock (600 ml) to go with the chicken. I wanted to do the pot in pot method but because jasmine rice takes less time to cook I decided to cook it separately. I added a cup and a half of water to the instant pot and a trivet to hold the bowl with the rice. I then cooked the rinsed rice for 1 minute on high and 10 minute release and it was beautifully cooked topped with the lemon sauce and chicken what can I say but a whole lot of wow. Great combo on the Lemon chicken and chicken flavored rice! Sounds like your family had an awesome & wonderful chicken theme dinner together! Please take care & we will see you around!! This was amazingly tasty. This is the second recipe I’ve tried of yours and both have been phenomenal! I never need to change a single thing! (and I seriously tweak and put my twist on everything!) I can’t wait to explore all your recipes. P.S. I second a cook book but first want to wish your family health and healing. Family member just had an operation this week! Two more to go!! I made this tonight. I think I put too much lemon in it. But it was good just to sour. Very easy to make.. Sorry to hear what happened. You can add some sweetness to the dish to cut down some of the sourness. I would like to make this with a whole chicken (about 4 pounds total) that I cut up. Are there any adjustments I need to make to the liquid or cooking time? Thank you for all of your delicious recipes! The liquid can stay the same and the cooking time will be 20 minutes + natural release. I would recommend using this method for whole chicken as the result will be better. Hi, Amy and Jacky! I have an 8qt Ultra and the manual says to never use under two cups of liquid. Do I need to increase the liquid for this recipe for an 8qt ip or can I stick with your original recipe? This recipe will work just fine in the 8 quart. I really love how you arranged the recipe from start to finish with steps, it’s so simple but it makes following the steps so much easier! Genius! And I’ll be making this recipe right now, thank you! How long would I cook bone-in or boneless chicken breasts with this recipe? Bone-in chicken breast will be 5 minutes + 10 minutes natural release. Boneless will be 5 minutes + 8 minutes natural release. If i don’t have rosemary, can i substitute something else? Also can I just use Drumsticks? Drumsticks will work fine. You can also use thymes. A few weeks ago I asked your opinion on the size of pot I should buy. You made 3 suggestions, 2 of which don’t seem to be available where I live. I bought a 6 qt Duo this week and made my first meal tonight. I used your Lemon Chicken recipe and it was really good and the recipe very easy to follow. Thank you for your input and for a great start to my IP experience. Hi. Making tonight. Question is the cooking time is 45 mi utes, but IP pressure time is 5 minutes with 10 minutes natural release. MwhT makes up the additional time? 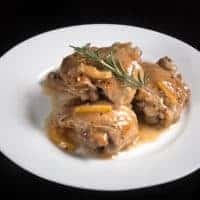 The cooking time is the total time including browning the chicken, deglazing, get up to pressure time, pressure cooking time, natural release time, and thickening the gravy. Do you have an instant pot recipe cook book I can buy? We don’t have a cookbook out yet as we have postponed the idea due to family’s health issue. What can I use instead of the shaoxing wine? It has wheat in it and we can’t consume gluten. In one recipe you say natural release THEN next step turn off heat. Do you use keep warm button on during natural release? If not, can I just unplug my IP when doing a natural release? Thanks for your wonderful looking recipes. I can hardly wait to start cooking in my IP. For the Instant Pot, turning off the heat or leaving in keep warm mode will work just fine! Made this tonight & it was wonderful! Actually, it was the 1st meal I’ve made in the Instant Pot & now I’m excited to try more! Thank you so much for using our recipe as your first meal! This looks delicious and will be my first recipe in my Crock pot pressure cooker. I have chicken leg quarters, will I need to adjust the cooking time? Chicken quarters will take 8 minutes + 10 minutes Natural release. 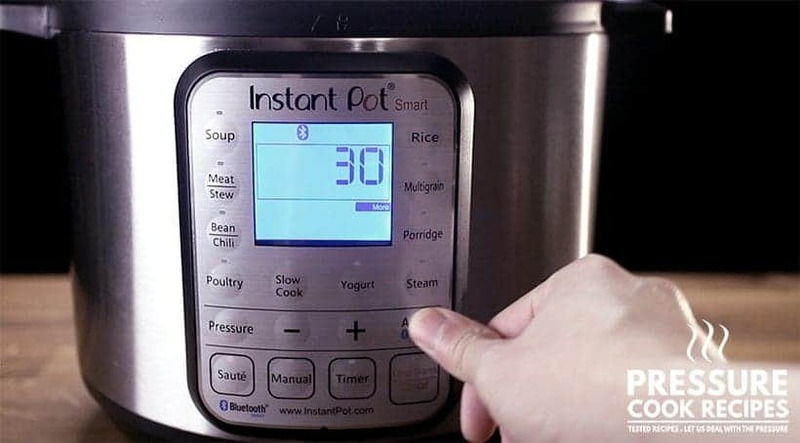 I have a Instant Pot Duo Mini. I would like to try the lemon chicken recipe, but I do not have the Saute more button. I do have Saute tab. Can I just use that? The mini have the ability to do Saute more. You will have to click on the saute button and then the adjust button or the saute button again to get to the Saute more function. What is the reason between “light soy sauce vs. low sodium in relation to results? My Safeway delivered the wrong one to me and my husband delivered the wrong one too. Now I have a lot of low sodium soy sauce. All of the recipes I’ve tried of yours have been absolutely easy, and perfectly delicious. You will want to taste and adjust the seasoning as low sodium soy sauce is less salty. I have cooked 4 of your recipes since receiving my Instant Pot for Christmas and all I can say is WOW! Every single one has been perfection. This Lemon Chicken is my favorite, it will absolutely become a staple in our household. So easy and really has that authentic Chinese restaurant flavor that I have always had trouble replicating until now. I added a little lemon zest too since I love strong citrus flavor. Thank you Amy & Jacky, your recipes have made me fall in love with pressure cooking! Thank you for using our recipes!!! Would it be ok to add a cup or two of sliced baby bella mushrooms to the garlic step? Thanks in advance! It will work and it will become Lemon Mushroom Chicken. I would recommend using 2 more cloves of garlic as well. This is the second recipe I have tried from your site and it was another winner! If I could give it more than 5 stars, I would. It’s easy and super delicious. Just a touch sweet from the honey, tangy from the lemon and savory from all the lovely bits of chicken after browning it. I’m printing out hard copy of the recipe now, making it a keeper. Thank you! What sides do you recommend with this dish? Rice and some veggies will be a great choice! Happy New Year to you as well. That is a great tip, I will use that next time & on other chicken recipes I try! Regards & I will be trying another one of your recipes again soon as I was still very pleased with my first one. Lemon Chicken Yum ! Here’s to the Instant Pot! I think I am going to love my new kitchen gadget! This is the third thing I have made in my instant pot. The flavour was good but I was a little sad that the skin was nice & crispy but after cooking it went soft. 🙁 Any tips? Wash the pot & sauté again? It is the natural of pressure cooking with it’s wet cooking environment. I would skip browning the skin on Step 3 and crisp up the skin under the broiler at the end (Make sure to pat dry the skin very well first). Would this recipe work as well for skinless thighs? I can’t find light soy sauce in my store today and was hoping to try this tonight. Will double the chicken for more leftovers. Any adjustments possible with kikkoman or tamari? I have both. Thank you! Just received an Instant Pot. Made this with 3 thighs, 4 drumsticks, and 2 breasts altogether. It was so good! Congrats on your new Instant Pot Sandra!! Let us know if you come across any questions. You know where to find us! This was the second recipe that I tried in my new instant pot and it was great! I’ll make it again. Next time though I want to make rice too…. it is begging to be served with rice. Can you cook rice along with the chicken at the same time in the instant pot or should I just do that on the stovetop? For this recipe, you can cook white rice along with the chicken using the Pot in Pot method. Please see this chicken adobo recipe for reference to the pot in pot method! Hi, I would love to make this. Is grapeseed oil or olive oil ok to use instead of peanut oil? If so, same amount? Love your recipes. Thank you! Both of the oils will work fine. This was delicious!!!! My husband loved it. I’m new to IP cooking and have found your recipes to be my favorite. I hope you keep it up and many thanks! Glad you enjoyed the lemon chicken too. I’m sure there will be lots more yummy meals to come. Wish you & your husband a blessed New Year! I am interested in trying out this recipe, but is there a suitable replacement for the Shaohsing wine? Would regular cooking wine work? (I assume that Rice Vinegar would be very different). Thanks. Dry Sherry wine will work. If you cannot find it, you can just substitute the Shaoxing wine with a dash of unsalted chicken stock as well. Do I need to double the liquid if I’m using 8 drums? No need to double the liquid. Made this tonight with two chicken breast there were still somewhat frozen I cut them in 3 pieces added a few minutes more pressure cooking. turned out excellent. Have a question How long is the cooking wine will still be good after opening when stored in the fridge? Shao xing wine can keep in a dark and cool cupboard for a long time. It should have a best before date on it. Hello! I have 4 drumsticks instead of 4 thighs and using an IP mini (3 at). Do I need to adjust anything in this recipe? Drumsticks will take 8 minutes + 10 minutes Natural release. I have a small whole chicken (4 lbs). How would I adjust the time? Thank you for your question. It will take roughly 16 – 20 minutes + Natural release. On a side note, the chicken will become quite tender. I would like to make this recipe tonight, but I only have chicken breasts instead of thighs. What changes do you recommend I should make to the recipe? I’m excited to try this – your pot roast recipe is a hit with my teenaged kids and their friends! They are a picky bunch, so I’m happy to have that recipe in my rotation. For this recipe, there will be no change. Looking forward to hearing more of your pressure cooking stories and seeing you around! I made this for dinner tonight, and it was delicious!!! Served with jasmine rice and steamed zuchinni. I love that it was easy to make, and lots of flavor!!! I’m very glad I gave this recipe a try, the sauce is delicious! I added frozen peas to the sauce before thickening as an additional texture and flavor element and it turned out great. It is so nice to hear from you. Hope you have been doing well. You can use Google translate to translate the website into French. We don’t have an orange chicken recipe yet! Stay tuned! Hi Amy & Jacky! I’m excited to be trying this out soon (hopefully this weekend). Is the nutritional factor for one piece of chicken? I was just thinking I wanted to make Lemon Chicken and this popped up in my timeline! Going to make this tonight. Thanks you so much for all you send to me, enjoy them to read ans some to try.